Tune into your breath, heart, and mind, and face your days with grace and balance. The Yoga Masters Meditation Series audio programs are powerful guided meditations led by teachers from the most respected yoga schools in the world. Their words, energized by deep personal experience, will lead both novice and experienced practitioners into deeper states of peace, insight, and awakening. These guided Yoga Meditations can open up a whole new dimension of your life. They are easy to follow and bring positive results from the very beginning. By tuning in to your breath, heart, and mind, you can find deep relaxation, intuitive guidance, and a calm strength to face your days with grace and balance. This CD will help clear your mind so you can consciously and purposefully create an extraordinary and energetic day. 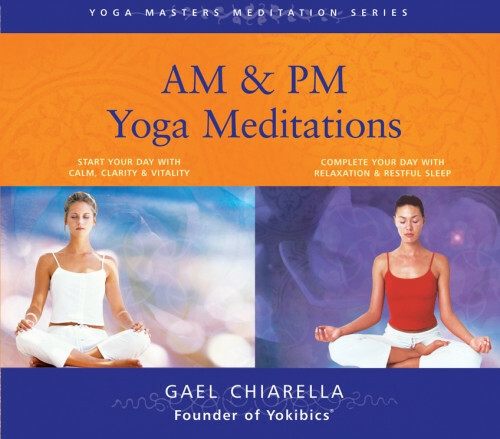 This CD will help ease you into a deeply relaxed, meditative state so you can let go of the day’s stress and prepare for a night of restful and rejuvenating sleep. Each CD contains four 15-minute meditations. Total playing time is two hours. Gael Chiarella, RYT and founder of The Yokibics® Institute for Personal Development, is a teacher, author, and life coach for individuals and organizations. Twenty-five years of training combined with a passion for an integrative approach to health led Gael to develop the Yokibics® Mindbody Fitness Program, which was named one of the nation’s top 10 fitness programs by American Health Magazine.